Danny Cheng: "With the promo code dannyc0391, you can earn Deliveroo HK$100 credit! 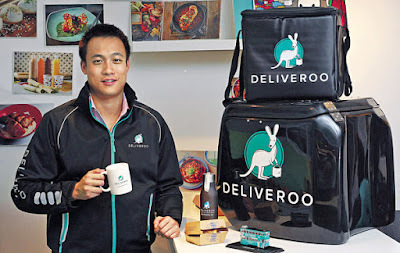 Redeem it at https://roo.it/dannyc0391"
Online food delivery companies foodpanda and Deliveroo plan to continue to expand their coverage of Hong Kong neighbourhoods, as tighter funding hits the on-demand food industry in overseas markets. Deliveroo, which operates in 12 countries, is focusing its efforts in on the customer. In May 2016, the company started offering ordering services in Hong Kong in Chinese and released the Android version of its app. Deliveroo targets the premium market, while foodpanda has a wider remit, which Bauer said allows it caters to the varied tastes of Hong Kong residents.